Victoria and Martin, from Aberdeen, had a clear idea from the start of how they wanted their wedding in Spain to look. The couple had their hearts set on marrying in the sunshine by the sea and having a beach club wedding in Marbella or the surrounding area. This is always a big plus when you are a wedding planner as it helps you know in which direction to start looking for the perfect wedding venue and suppliers. Beach club weddings on the Costa del Sol are a specialty of ours, so we were excited to get the opportunity to take them on our location tour around the coast. Victoria and Martin were staying in Puerto Banus and the night before we met had enjoyed a night out in the infamous Joy’s nightclub, so after a huge coffee we were on our way. We showed them a variety of villas and beach settings. We are spoiled for choice on the Costa del Sol when it comes to sea-views – we can source locations in private villas, prestigious hotels and even chilled out beach bars. The couple had also been busy researching themselves, and eventually they fell in love with the Marbella Beach Club, the crème de la crème of beach-side wedding venues. They chose to stay in a private villa in the Marbella hills where they also asked us to help them plan a chilled post-wedding pool party. 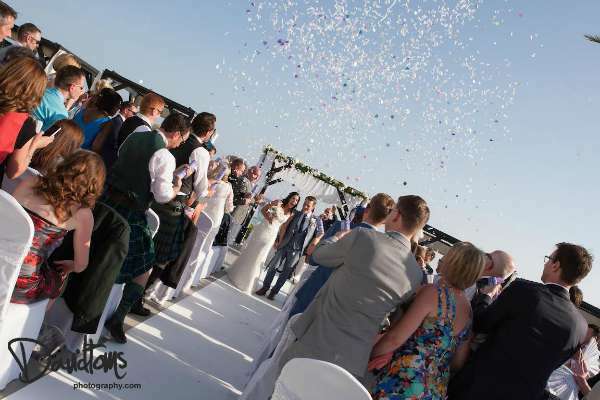 We pulled out all the stops for our Scottish couple and their beautiful Beach Club wedding in Marbella was a day to remember. The venue, an impressive club with the sea as its backdrop and elegant pergolas surrounded a luxurious pool, was decked out in all white and crystal details, with lots of finishing touches that the couple had brought over themselves from Scotland. As Martin likes mountain biking they even included a bike wrapped in white ribbon in the entrance pointing the way to the ceremony. The stunning table plan was a collection of shimmering crystal frames Victoria had handpicked from back home, the guest book was also themed and they had even brought over their own bespoke shimmery ribbons for the chairs. The ceremonial pergola was bedecked in tiny hanging crystals that caught the sun and reflected the twinkling sea in the background, with sumptuous white lilies, roses and orchids decorating the beams, supplied by Kathryn from Marbella’s top wedding florists. Find out all about Victoria and Martin’s big day in Part 2, and discover what big secret Martin had been keeping from his new wife!